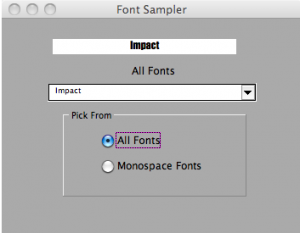 The other day a reader asked about how to get a font list to a combo box so his users could have a choice to specify. Borrowing shamelessly from John Walkenbach’s Tip 79, this is one way to do it. I use this approach when I take a spreadsheet to a web table and want to specify the font. Me.cboFontOther.Text = "Comic Sans MS"
If i <> FontList.ListCount Then InstalledFonts = InstalledFonts & ","
"Tlwg Typo,Bitstream Vera Sans Mono"
Str1 = TempFont(i) & ","
If i <> UBound(TempFont) Then TempStr = TempStr & ","
It has the “Get Property” at the top. I screen the installed fonts to filter the Asian fonts from my list. Remove the “Like” operator if you need them. I capture the the installed fonts as a global string variable in a comma-delimited list. The list of monospaced fonts came from here, and represents the fonts installed as a minimum on ⅓ of all Windows, Mac, and Unix computers. They’re listed in percentage order irrespective of machine and not by installation count. Me.lblFontcboOverLabel = "Jackdaws love my big sphinx of quartz."